You might want to jump on that because my May game was almost sold out! I’ve only been to Phillies opening day once. It was back in the wild and woolly days of Vet Stadium and the “highlight” was Mom and I fleeing our section as people threw full cups of beer over our heads at people in the rows in front of us. The best panoramic picture I’ve ever taken. I already have tickets bought to one game this season, and I’m looking to go to at least 2 more. WM says this song always puts him in the “Spring” frame of mind, and I agree 100%. Put me in, Coach. I’m ready to play! What? My site was down you say? 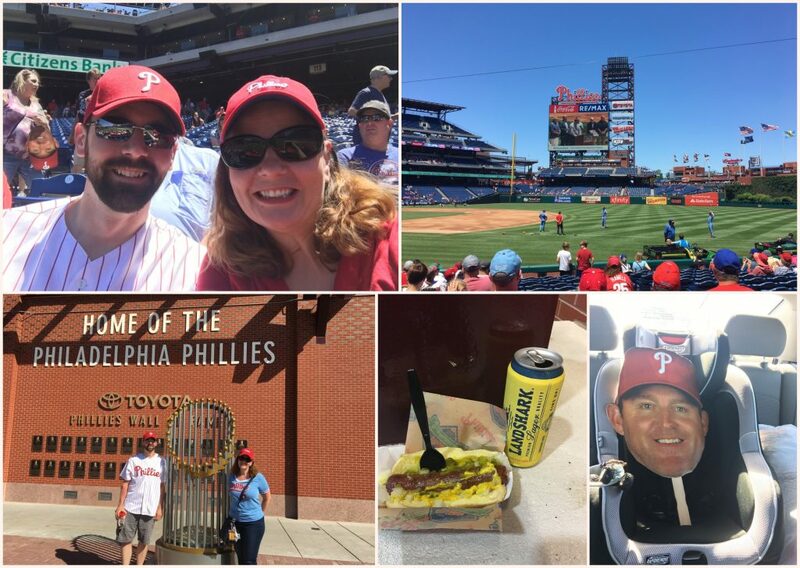 It was a great week, highlighted by going to the daytime Phillies game on Thursday with my brother John, who never reads my blog. It was Jim Thome day and everyone received a Thome head on a stick. And today I spent as much time outside as I could. We did a crapton of yard work and did you know it’s a thing in this neighborhood to remove the weeds between the edge of your driveway and the street? Suburban lawn care peer pressure is definitely a thing. Time for the Friday 5. This week’s theme is Opposite Day. Let’s get to it! 1. What food, normally eaten cooked, do you prefer uncooked? I like eating potatoes raw. I also like cake batter, raw eggs and all. I’m a rebel that way. 2. What food, normally eaten uncooked, do you prefer cooked? I don’t eat sushi made with raw fish. I like the cooked versions instead. Spicy shrimp and spicy crab. I also prefer my steak cooked to medium-well. 3. What food, normally eaten cold, do you prefer hot? 4. What food, normally eaten hot, do you prefer cold? I’m a purist. I hate cold pizza and cold spaghetti. And everything I do eat cold, I would never want heated up. I mean, I MAY have drank unfrozen Otter Pops once upon a time, but then I turned 45 and gave up those childish things. Mac and cheese should be hot. Macaroni salad should be cold. What’s wrong with you people? 5. What are your favorite dinner meals to have for breakfast and breakfast meals to have for dinner? I enjoy bacon and eggs for dinner. And I’ve enjoyed pizza for breakfast. Warmed up, because what is WRONG with you people? I hadn’t watched baseball in a few years, disgusted both by the home team jacking up ticket prices once the team started winning more and by everyone and their dog wearing the home team’s merchandise — now that the home team was winning. This was a much easier read for me than The Big Short, possibly because I cared about the characters more. I found myself looking up the players on Wikipedia to make sure things turned out okay for them. I also discovered that I find Billy Beane more attractive than I find Brad Pitt. I finished this book with a greater appreciation of baseball and the backroom nerds who make it awesome. I want to start watching baseball again. And while I’ll start watching the home team again, I’ll keep an eye on those amazing Oakland As. Michael Lewis’ writing is fantastic, as long as you don’t read his epilogues. If you read his books a while after they are released, you’re treated to an extra epilogue about how fantastic his book was and all of the stir it caused. I wish he didn’t do that, because the self-praise leaves a bad taste in my mouth.